India solar water pumps (SWP) market exhibited substantial growth over the past few years. Growing adoption of renewable energy resources, especially solar energy, government initiatives such as KUSUM scheme to provide 2.75 million solar pumps to farmers, subsidy provision, and lower operating cost of solar pumps are some of the key factors driving the growth of solar water pumps market in India. In 2017, The Western region contributed highest India solar water pumping systems market share. However, the Northern region is anticipated to register highest growth during the forecast period owing to various state government targets of solar pumps installation in the region. The India solar water pumping systems market report thoroughly covers the solar water pumping system market by power ratings, design, drive, applications, and regions. 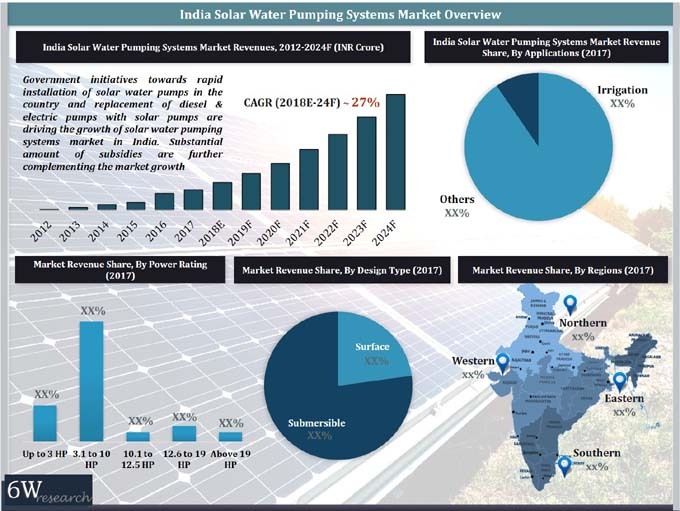 The India solar water pumping systems market outlook report provides an unbiased and detailed analysis of the India solar water pumping systems market trends, opportunities/high growth areas, and market drivers which would help the stakeholders to device and align their market strategies according to the current and future market dynamics.